Download Cembrit's two manuals that deal with the installation of Cembrit facade boards Cover, Solid, Patina and Transparent on a wood or aluminium system. Cembrit is one of the leading European manufacturers of multi-capability fibre cement building products. Our products and solutions add exciting new design opportunities for moulding attractive, durable settings for people’s lives. But Cembrit is more than mere products. We also help make all kinds of design and construction projects easier as well as more profitable, inspiring and effective. And for us, all construction also involves building relations with people, making your day better, and helping you make the day better for others. Cembrit fibre cement is a modern building material made from natural and environmentally-friendly raw materials. The technology has been developed by Cembrit, having more than 90 years of experience within the manufacture of fibre cement. Our wide experience ensures a sustainable product which has accumulated all the advantages of fibre cement. The facade range can be used in all self-ventilated ligh weight facade constructions. 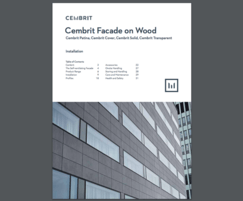 Featuring properties such as non-combustibility, sound and weather insulation as well as high impact strength, Cembrit fibre cement boards are the ideal facade material.